There’s a good chance your smartphone contains tainted cobalt. The metal is a crucial ingredient in most of the lithium-ion batteries that power our devices, and 70% of it is mined in war-torn Democratic Republic of Congo (DRC), where children are often deployed to work in toxic environments. Though global brands like Apple and Samsung are keen to clean up their supply chain, DRC’s dominance of the cobalt market makes the task difficult. These brands are also pressured by growing demand for cobalt, which Citigroup estimates will outstrip supply by 2023. That’s because lithium-ion batteries also power electric cars, and every car battery needs as much as 1,000 times the amount of cobalt of a smartphone battery. Though companies are working to reduce the amount of cobalt used, experts say it will remain a crucial elements in batteries for at least the next decade. 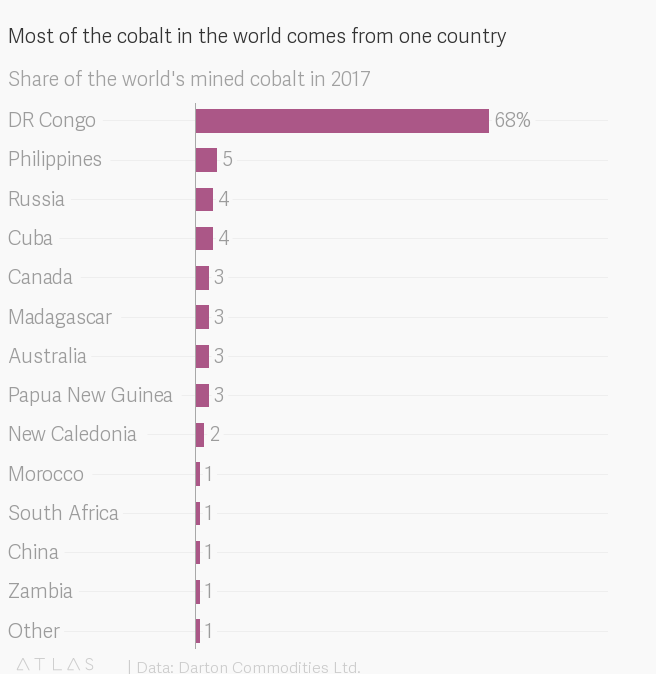 The only way to relieve the growing pressure on this resource is to find new cobalt mines in countries other than the DRC, preferably ones with strict labor and environmental laws. Kobold, a California-based startup, believes artificial intelligence might make that possible, and it has just bagged funding from Bill Gates-backed Breakthrough Energy Ventures and venture capital firm Andreessen Horowitz. Launched in 2018, Kobold—which is the root of the elemental name “cobalt” and also means “goblin” in German—now employs some 15 people with at least 10 PhDs among them, whose expertise ranges from quantum computing to economic geology. CEO Kurt House, who holds a PhD in earth sciences from Harvard University, has previously started multiple companies that used technology to make oil and gas extraction more efficient. Cobalt is mainly extracted as a byproduct of copper or nickel mining. The metal itself isn’t rare, but until recently miners haven’t had the incentives to go looking for it specifically. Kobold’s bet is that it can sniff out new cobalt reserves by deploying machine learning and other AI techniques to large sets of geological, physical, and chemical data. Though mining companies have their own big-data tools, House says that they are mostly deployed for operational efficiency and not exploration. Once Kobold’s data wizardry finds a potential mining site, the startup will go through the hurdles of acquiring exploration rights. It will then deploy its own staff to test whether reality matches up to the numbers. If it does, Kobold will develop the site and then sell it off to the highest bidder. The startup has been in operation for only a year, but has already acquired “a few” pieces of lands, according to House. The company won’t reveal how many or where they are. Exploration of natural resources, however, is a high-risk endeavor. Kobold will likely encounter a lot of dry wells before it hits oil (or, rather, cobalt). That’s why House is happy to have the backing of BEV, which benefits from the deep pockets of billionaires like Jack Ma, Richard Branson, Mukesh Ambani, and Michael Bloomberg. Unlike most venture firms, BEV says it provides “patient capital” because innovation in the hard sciences proceeds at a much slower pace than at, say, software startups. Kobold is only the 12th company it has invested in so far, after Quartz broke the news about its first two investments in June and seven more investments in September.